A partnership of conservation organisations is looking for enthusiastic volunteers to protect and monitor vulnerable birds nesting along the coast this summer. These include the endangered little terns, arctic terns and ringed plovers, which are collectively known as shorebirds. Little terns spend their winter on the west coast of Africa and return to our coastline at the end of April. These rare birds lays eggs on the beach and are very susceptible to human disturbance, as well as predation and high tides, which can wash away their nests. In Northumberland, little terns mainly nest on the National Trust Long Nanny site in Beadnell Bay and Natural England’s Lindisfarne National Nature Reserve (NNR), which stretches from Budle Bay in the south to Cheswick Black Rocks in the north. Katherine Dunsford is Lead Shorebird Warden at Lindisfarne National Nature Reserve, where she will be responsible for shorebird monitoring, public engagement and volunteer coordination. Katherine will recruit, train and support volunteers working with shorebirds. Katherine said: “I am really excited about taking up this role; volunteers are essential for the protection of our breeding shorebirds. Together with the team of wardens, shorebird volunteers will talk to beach users to prevent them from accidently disturbing the birds. This makes a huge difference to the breeding success of these small visitors. 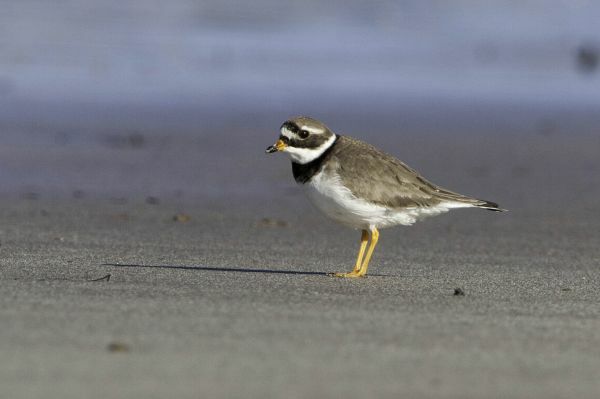 The other shorebird species of concern is the ringed plover. This charismatic little wading bird also lays eggs on the beach. Numbers of breeding ringed plovers have dramatically declined and this year conservationists are asking volunteers to carry out a survey of the whole Northumberland coast to get a better idea of how many birds there are and which areas are important for them. Talking about the ringed plover surveys, Iain Robson from the Northumberland Coast AONB Partnership said “ Working with Natural England and National Trust, we need to learn more about where these little birds are nesting and how we can protect them in the future. There is over 70 miles of coastline to survey so we are absolutely reliant on volunteers to help us - we couldn’t do it without them. If you are interested in protecting and monitoring terns at the breeding colonies or surveying sections of the coast for ringed plovers please contact Becky at Coast Care on 07813 563047 or email becky@coast-care.co.uk. Full training will be provided for all volunteers and a training session will be held in Seahouses on Monday 1st April at 2pm. Dramatic views, sandy beaches and iconic castles - this is the essence of Northumberland's coast. Our coast is recognised by experts as a place where you will come across some rare and endangered wildlife.